Stay Outside... Stay Healthy™ this Summer with our season long Mosquito Control service. At mosquito.buzz, we professionally treat your property to control mosquitoes at your home, cottage, cabin, special event, or outdoor wedding. We offer both all-natural and synthetic control options to suit your preferences. Our expert team of licensed and trained technicians will visit your property every 21 days to ensure you and your family are protected from mosquitoes and the harmful diseases they carry. Stay Outside... Stay Healthy™ this Summer with our Tick Control service. Lyme Disease is on the rise across Canada and is being spread by the increase in Black Legged Tick populations. With mosquito.buzz, you can eliminate the threat of tick infestations on your property and protect your family from the risks associated with them. Our Tick Control service specifically targets ticks during the Spring and Fall seasons when they are the most active and when you and your family are at the highest risk of exposure. 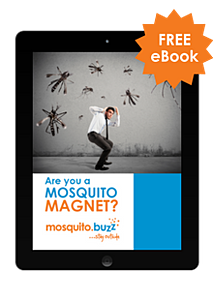 In this guide, you'll learn what factors make people attractive to mosquitoes, and how you can avoid mosquito bites all season long. “I used to get eaten alive if I spent more than 5 minutes outside. We tried the mosquito control service after a friend told us about it and have never been so happy. I have yet to get a mosquito bite since." "Our daughters outdoor wedding couldn’t have been more enjoyable. We literally didn’t have any unwanted guests! We are so happy there were no mosquitoes all day long."